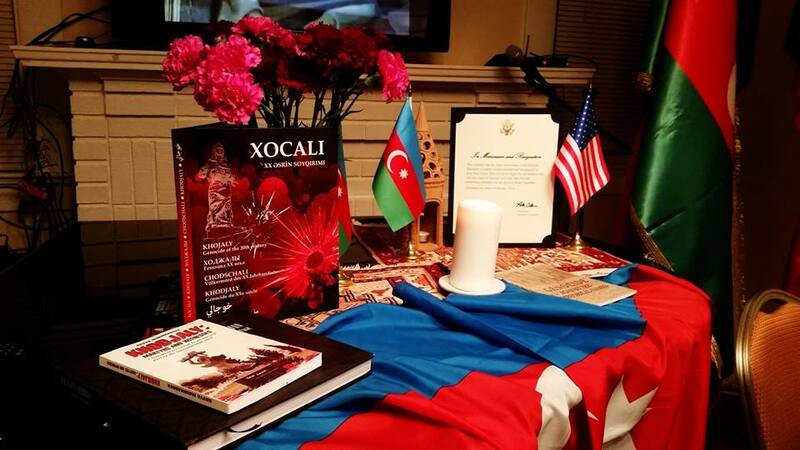 In Texas, Khojaly commemorations started on February, 17th 2015 with an event organized by Assembly of the Friends of Azerbaijan at the State Capitol in Austin, TX. On February, 18th 2015, the Azerbaijan Center with the support of its amazing volunteers organized an event in its facility commemorating the 23rd anniversary of the Khojaly Massacre that occurred in Azerbaijan on February 25th & 26th 1992. Mrs. Irada Akhoundova, CEO of the Azerbaijan Center, opened the event with a brief introduction about the commemoration. The introduction was followed by a commemorative minute of silence. The documentary was followed by a speech from Mr. Ryan Kennedy, Assistant Professor in the Department of Political Science at the University of Houston and founding director of the University of Houston’s Center for International and Comparative Studies. Kennedy’s work has spanned a number of areas in comparative politics and international relations, primarily dealing with stability and change in political institutions. In his speech, Ryan Kennedy spoke about the Khojaly tragedy while comparing it to the one in Ukraine. He made an emphasis on the important of getting world attention which was currently not sufficient and the necessity of continuously work on increasing tragedy awareness worldwide. Mr. Mammad Talibov, counselor of political and legal affairs for the Embassy of the Republic of Azerbaijan to the United States of America in Washington, D.C., delivered a speech that included an overview of Khojaly tragedy’s facts. Mr. Talibov made an emphasis on the refugee still suffering in Azerbaijan. To this date, this unresolved situation in Azerbaijan is still considered to be a frozen conflict with about 18% of Azerbaijan territory still occupied by Armenians. The importance of maintaining a united and strong Azerbaijani diaspora around the world is crucial to increasing awareness about the ongoing conflict. Mr. Talibov highlighted the fact that nowadays, over 15 U.S. states have recognized and commemorated the tragedy – with Texas ranking among the first ones on the list along with several countries worldwide with Turkey among them. Mr. Abdullah Topcu, Vice-Consul of the Consulate General of Turkey in Houston commented that Turkey is a strong supporter of Azerbaijan and shares the heartfelt pain of Azerbaijani people about the Khojaly Tragedy. Mr. Topcu reaffirmed that Turkey and the Consulate of Turkey in Houston will remain supportive to the Republic of Azerbaijan and, at a more local level, to the Azerbaijani diaspora in Texas and the Azerbaijan Center. Mrs. Akhoundova highlighted the willingness of the Azerbaijan Center to maintain unity among organizations in Houston and was happy to introduce Mr. Javid Zeynalov as an active leader of the Azerbaijani community in Houston and President of Houston Azerbaijanis. Mr. Zeynalov reminded the guests of Houston Azerbaijanis’ commemorative Khojaly Peace Rally to be held on Saturday, February 21st 2015 from 10:30am-12:30pm at the crossing of Westheimer Rd & Post Oak Blvd. The gathering will be @Starbucks to pick-up posters and flyers. The announcement of Mr. Zeynalov was followed by an open questions session to the speakers. As a small token of the Azerbaijan Center’s appreciation for his support and participation, a gift in form of books was made to Mr. Ryan Kennedy to keep spreading the word and educating other communities about the Khojaly massacre and the importance of having it recognized. Once the commemorative session adjourned, all the guests gathered for a casual meet and greet session where light finger foods and Azerbaijani tea. The Azerbaijan Center would like to extend its sincere thanks to all the volunteers, the speakers and the participants for attending the event and for their constant support to our organization and for commemorating with us such an important date for the Azerbaijani people. The American-Azerbaijani community would also like to extend its heartfelt gratitude to Congressman Pete Olson and State Representative Gene Wu for their continued support. The Azerbaijan Center also participated in the commemorative event organized by the Azerbaijanian American Cultural Alliance on Sunday, February 22nd 2015 at the Turquoise Center in Houston, TX. We appreciate and support all organizations and members’ efforts in increasing awareness about Khojaly massacre by creating a strong impact in Texas through the different initiatives organized. Following all the commemorations in Texas, the Azerbaijan Center’s CEO, Mrs. Irada Akhoundova participated in other events organized in Washington and Pennsylvania by the Embassy of the Republic of Azerbaijan and the Assembly of the Friends of Azerbaijan. The Azerbaijani community and Azerbaijani State Representatives feel very appreciative of the support from the American community and State representatives in commemorating Khojaly Massacre.